Indonesian artist Arkiv Vilmansa has been painting, illustrating and designing cartoon-like figures since 2005. Shortly after finishing his Bachelor degree in Architecture, he plunged into the art world citing his love for drawing figures as his inspiration for this change of career path. Arkiv had a strong debut with his first vinyl figurine called Arkiv Instant. After Arkiv Instant, many exciting vinyl toys followed including a redesign of Mickey Mouse for Disney Asia. 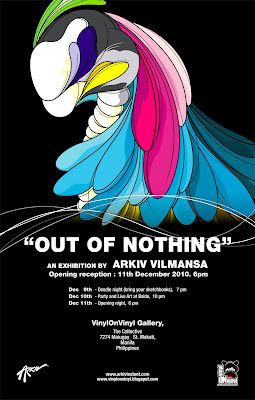 “Out of Nothing” is a portal into Arkiv’s parallel world. Harnessing creations from his lucid dreams. Eloquently using each stroke to make curves so vivid and fluid as it forms along the surface. Slowly embodying such playfully bold creatures that evoke a strange charm to them. Some having bunny ears, others having ears that resemble a mouse. Most vaguely reflecting creatures from our daily lives yet cleverly manages to escape such conformity. Possessing dynamic movements that makes you feel that they are going to break through the very canvass in which they were formed.